Travel to the French Riviera with Grace Kelly and Cary Grant by way of Alfred Hitchcock's To Catch a Thief. The romantic thriller won an Academy Award for cinematography, with additional nominations for costume design and art direction. "In his accustomed manner," wrote critic Bosley Crowther, "Mr. Hitchcock has gone at this job with an omnivorous eye for catchy details and a dandy John Michael Hayes script. Most of his visual surprises are got this time with scenery— with the fantastic, spectacular vistas along the breathtaking Cote d'Azur." 35mm print form the Yale Film Archive. Visit the event page and download the poster! Construction will start in the Spring, after Commencement, on a renovation of the Anne T. and Robert M. Bass Library to accommodate the growing student population. Bass Library is a favorite study space for many Yale College students. Last renovated in 2007, the two-story underground library holds about 150,000 items, including scholarly works related to the undergraduate curriculum, English-language literature, graphic novels, DVDs, and audiobooks. After renovation, the collection will be curated with the goal of encouraging students to explore and engage with the materials more intensively. The project, now being led by Assessment Librarian Sarah Tudesco, started last year with open meetings, design charrettes, and a comprehensive study by anthropologist Nancy Fried Foster of how students and faculty perceive and use Bass. Students go to Bass expecting study space to be available. If they begin to perceive Bass as overcrowded, they will likely go elsewhere. Students choose Bass when they have papers, problem sets, or other work to do for class, and they tend to work alone there, rather than in groups. 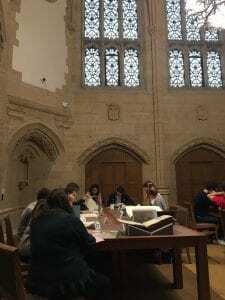 Many students find it motivating to have peers working nearby, but they also seek to limit distractions by working in study carrells and individual study spaces. Students like to work in a library where they are surrounded by books. They seek out course reserve books from the stacks, but they do not spend much time randomly browsing. Faculty place a high value on opportunities for students to use and browse in the physical collections, and especially on the educational impact of serendipitous discoveries. Some faculty worry that reducing the size of the collection to provide more study space will have a negative effect on students’ library experience and academic development. To address these factors, the planning committee will continue working with students and faculty to develop an appropriate collection strategy. Architects from DBVW Architects will share designs with faculty, staff, and students for review and comments. 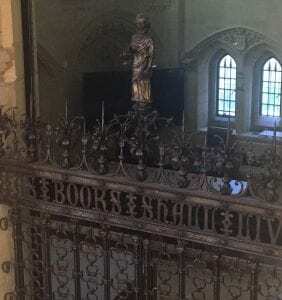 The Bass collection will be housed in the Sterling Library stacks until the project is completed in early 2020. Some of the Bass books will remain in Sterling, interfiled with the books already in the stack tower. Others will be returned to the renovated Bass Library. In 2018, in anticipation of the centenary of the birth of Swedish film director Ingmar Bergman (1918-2007), the Yale Film Study Center began working with the Swedish Film Institute to strike new 35mm prints of eight of Bergman's most iconic films for Yale's collection. In order to create these unique prints from the SFI's preservation negatives, the FSC edited and improved the films' English subtitles and worked with the only remaining film lab in the United States capable of etching laser subtitles onto 35mm films. Support for this project was provided by Marlene and Gene Siskel '67 and by Yale's Fund for Lesbian and Gay Studies. This fall, these eight new 35mm prints will be shared with Yale and New Haven through four double-feature screenings in Through Bergman's Lens: Ingmar Bergman Centenary Film Series. The Yale Film Study Center has been awarded a $24,000 matching grant from the National Film Preservation Foundation to preserve Street Corner Stories, an iconic 1977 documentary produced by filmmaker Warrington Hudlin ’74 in New Haven. In Hudlin’s film, convenience store employees, customers, Yale employees, neighborhood kids, and others mix and meet at a New Haven convenience store, sharing jokes and stories, drinking coffee, and talking politics. Shot in cinéma vérité style, the film documents a unique storytelling form, an African American street-corner vernacular that Hudlin presents as a spoken form of the blues. Hudlin was born in East St. Louis, Ill., in 1952 and came to Yale in 1970. During his senior year, he was named to the Scholars of the House program, an honor that came with the responsibility of creating an “essay or project which must justify by its scope and quality the freedom which has been granted.” Hudlin chose to make a film, eventually called Black at Yale: A Film Diary, which grew out of his own “split-consciousness experience” of being an African American student at Yale in a time of heightened political awareness and tension. The Film Study Center preserved Black at Yale in 2017. Street Corner Stories grew out of one of the final scenes (pictured below) in Black at Yale, in which one of the film’s main characters stops by a convenience store at the corner of Lake Place and Dixwell Avenue and falls into conversation with some of the regulars about their perceptions of Yale. The interactions Hudlin captured resonate with the “up-South” accents and sensibility he grew up with in East St. Louis, another community shaped by the post-World War II migration of African Americans from the rural South to the industrial North. Hudlin’s affinity for the blues, jazz, and rock and roll originated there, too; his neighborhood was home to Ike and Tina Turner, Miles Davis, and the gospel singer Brother Joe May. In his first year at Yale, he read Ralph Ellison’s essay “Richard Wright’s Blues,” which introduced him to the idea of the blues “as more than a musical form, as an aesthetic and sensibility, an essential view of the world.” Six years later, he brought Ellison’s concept of the blues as a form of storytelling to Street Corner Stories. The film premiered with a screening at the York Square Cinema in New Haven and subsequently screened on the domestic and international festival circuits, where it was well received. One contemporary reviewer called it “an excellent study of black language styles and story-telling.” In recent years, however, the film has been little seen, with only a few known copies. In 1978, Hudlin and two fellow Yale graduates, George Cunningham ’83 Ph.D. and Alric Nembard ’73, co-founded the Black Filmmakers Foundation, a non-profit that supports and advocates for black filmmakers. As president of the foundation, Hudlin has mentored generations of young filmmakers. He is also a producer, director, writer, and actor whose credits include House Party (1990), Boomerang (1992), and Cosmic Slop (1994). “I realize now that when I came into the world as a filmmaker it was like walking into a field that had not been plowed,” Hudlin says. “I took Street Corner Stories to an art house in New York. The person there asked what language it was in. I said English. And they said, will you have subtitles? The Yale preservation project will use the original and best surviving elements of the film, donated to the Film Study Center by Anthology Film Archives in 2017. Hudlin had given the center a collection of original interviews, trims, outs, and audio elements for the film in 2014, but it was only when preservation work began on Black at Yale in 2016 that the original A/B rolls and optical track negative for Street Corner Stories came to light among a trove of materials Anthology had rescued years earlier from a defunct film lab. Now, Fotokem, one of the last remaining film labs in the United States, is creating a new 16mm black and white duplicate negative of Street Corner Stories. Audio Mechanics, an audio restoration lab, will capture and digitally restore the film’s audio, and DJ Audio, specialists in film sound, will create a new optical track negative. Fotokem will create a new 16mm print for screening as well as a high definition digital scan of the new internegative to create a digital access copy of the film. The Yale Film Study Center supports teaching, learning, and research, and fosters film culture at Yale through collection, preservation, access, and exhibition. The center has been part of Yale University Library since 2017. The National Film Preservation Foundation, a nonprofit created by the U.S. Congress to help preserve America’s film heritage, has awarded eight preservation grants to the center and the library since 2008. Join us for the fifth year of Treasures from the Yale Film Archive, which begins with five great films in 35mm this fall. 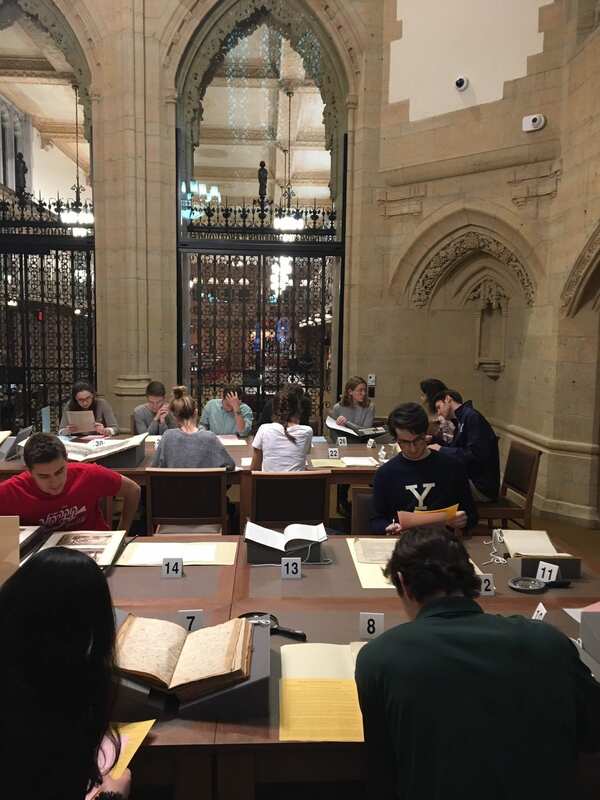 Yale University Library has been selected to receive the first annual Ivy Award from New Haven Promise, a program that provides scholarships and career development support to graduates of New Haven schools. The award, which will be presented at the group’s annual Scholar Celebration on Aug. 16, recognizes the library’s strong support of the group’s career launch and civic engagement initiatives. The eleven Yale University Library interns are working in Library Information Technology, the Center for Science and Social Science Research, the Stat Lab, Assessment and User Experience, and the Beinecke Rare Book and Manuscript Library. 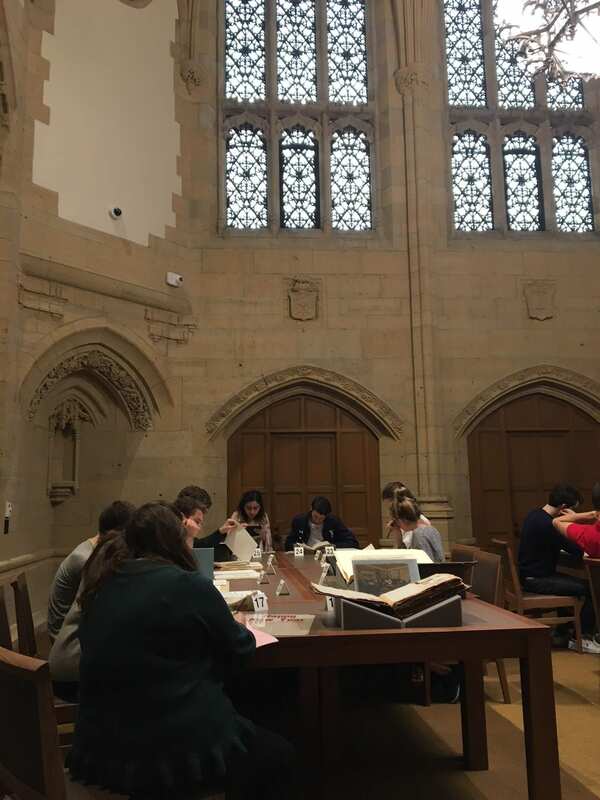 Two more Promise interns are working in the library of the Yale Center for British Art and one in the Lillian Goldman Law Library. All together, Yale libraries are hosting fourteen of the ninety-eight Promise interns at Yale this summer. Shirley-Ann Feliciano and Sam Smith (pictured here) have been interning with Geographic Information Systems (GIS) Librarian Miriam Olivares in the library’s Center for Science and Social Science Information. The two students have been creating and updating instructional videos used to teach GIS, sophisticated data mapping software that can be used to analyze, manipulate, and present any geographical data. On July 31, they presented an introductory GIS workshop for eighteen of their peers, and in early August they helped Olivarez teach GIS workshops for New Haven middle-school and high-school students. Feliciano was familiar with GIS from her studies at the University of New Haven, where she earned her bachelor’s degree in criminal justice with a concentration in crime analysis. The summer’s experience has deepened her understanding of the versatile software as well as video production techniques. Smith, a pre-med student majoring in math and chemistry at the University of Miami, had never heard of GIS before this summer. Now, he sees the enormous potential for GIS applications such as analyzing and predicting the spread of disease. The internship “has opened up a whole new world of possibilities,” he said. Haughton, a rising senior and English major at Skidmore College, said he has particularly enjoyed seeing original historical materials up close and talking with researchers about their work. 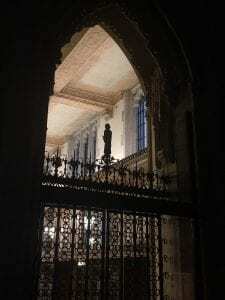 The experience has increased his understanding and appreciation of the Beinecke’s unique role. “I am grateful for the time we have been able to spend with some of this summer's researchers,” he said.